This project is Phase 2 of a project to build Roofwater Storage Tanks (Tanks), which collect and store rainwater from roof runoff, at schools and households in the area served by a Kirucodo, a Ugandan NGO. In this phase of the project, a total of 9 Tanks are to be built; 2 at each of 4 area primary schools and a 2nd tank at the primary school served in Phase 1. 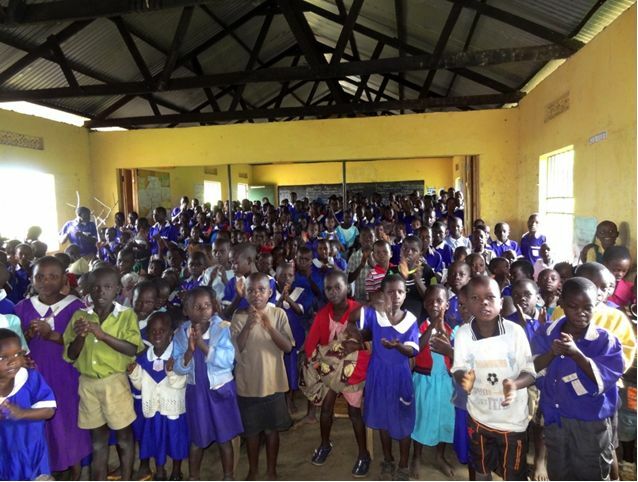 These 5 primary schools each have approximately 350 pupils for a total enrollment of about 1,750 pupils. None are served by piped water or electricity. Schools require a minimum of 0.5 litres of water per day per pupil, about 175 litres. The water is primarily used for the preparation of a daily dinner, which is usually a bowl of porridge supplemented by a stewed vegetable dish or fruit. For most students this meal is the largest and most nutritious meal of their day. Water is also used for washing and drinking. 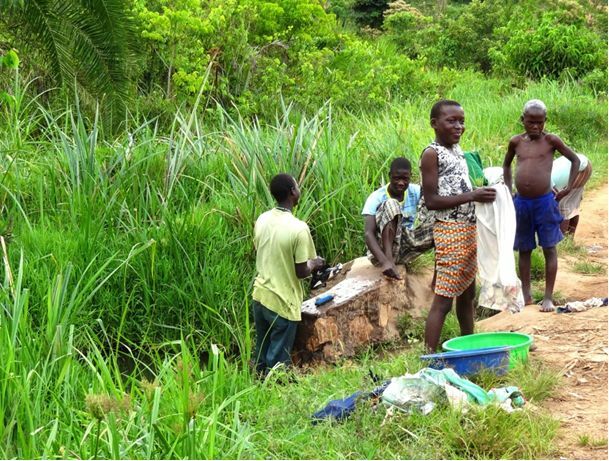 Currently, water is collected by children using plastic jerry cans. For all schools, the round trip to the nearest water source is over 1.6Km (1 mile) with an elevation change of 50-90 metres (150-275 feet) from the water source to the school and takes an average of 1.5 hours. The uphill return journey, with each student carrying one or two jerry cans of between 10 and 25 litres, represents a load of between 50 and 80% of their body weight (water weighs 1 kg/litre). These trips result in a significant reduction in classroom time for students – estimated to be as much as 165 hours/year/pupil. Most children are required to make the trip again after school to collect water for household use. 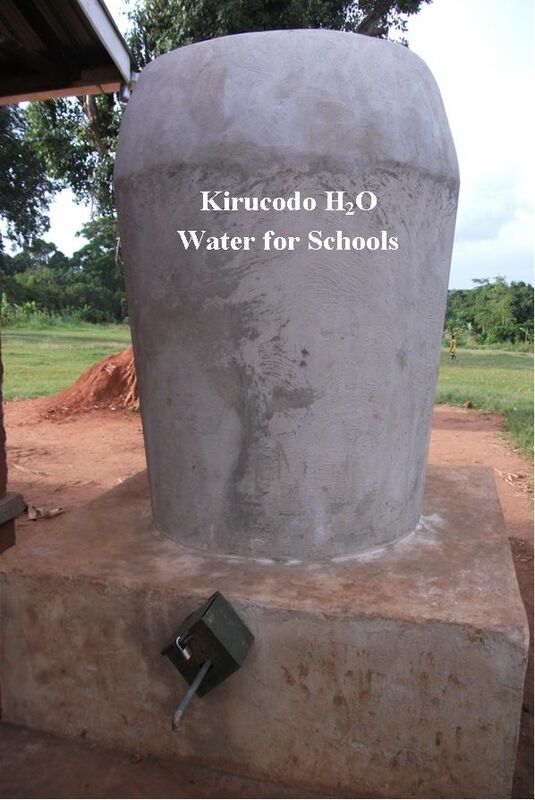 The Phase 1 tank was constructed at Kikandwa Church of Uganda Primary School. The objective was to demonstrate that roof water storage is a viable means of meeting water requirements in the area. This tank has been in service for 6 months, enabling the school to meet the needs of providing water at schools for daily use. While modeling using area rainfall statistics indicated a 2,500 litre tank should meet the daily needs of area schools, the high variability of rainfall over the recent dry season caused the tank to run dry several times. Although a single larger tank would be possible, given that many schools are comprised of multiple buildings the use of two tanks better suits the ability for rainwater to be collected. It also provides an added level of backup in the event that one tank is required to be taken out of service. Consequently, it has been decided that a two-tank installation, providing 5,000 litres of storage capacity at each school is the desired way forward. Phase 1 showed that material to construct a tank at a school cost approximately $US 550. Consequently the budget for this project is set at $US 5000. All tanks are built with volunteer labour provided by area residents. 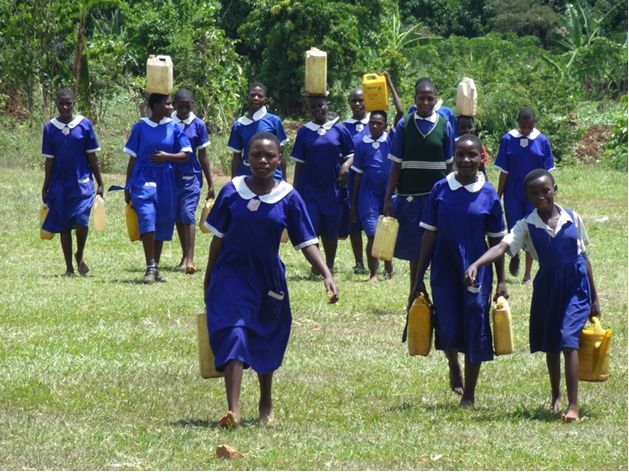 Girls with water collected – almost back to school after a 90 minute trip. The area in which Kirucodo operates encompasses 56 villages and a population of approximately 33,000 within Kyampisi sub-county of Mukuno District, Uganda. Residents of the area are primarily subsistence farmers. Local incomes average under $2 per day. Over 50% of the population is under the age of 16. There are 18 primary schools in the area with a total enrollment of approximately 6,500 pupils. None of the schools are served by piped water or electricity. For most schools the round trip journey to collect water takes an average of 1.5 hours, resulting in a significant reduction in classroom time that is estimated to be as much as 165 hours/year/pupil for year 3-6 students. In July 2010, the UN General Assembly adopted Resolution 64/292 recognizing that safe and clean drinking water (and sanitation) is a human right essential to the full enjoyment of life and all other human rights. This augmented the Millennium Development Goals (MDG’s) established by the UN in 2000 that set the objective of halving the number of people without “reasonable” access to an Improved Water Supply between 1990 and 2015. Improved Water Supplies are defined by the World Health Organization (WHO) as household connections, public standpipes, boreholes, protected dug wells, protected springs, and rainwater collections and meet the WHO criteria of providing “reasonable” access if they provide a minimum of 20 L/person / day. 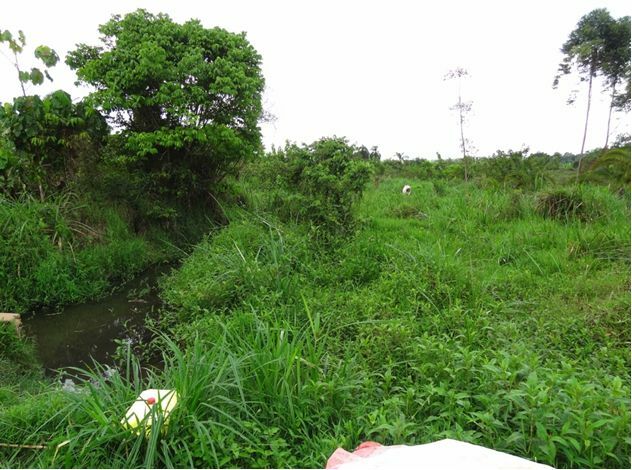 It is estimated by Kirucodo that over 80% of the population, and all area primary schools, draw their water from unimproved sources, primarily open streams and ponds. Many, including all primary schools, are located at a distance in excess of 1 km from the nearest source. Consequently, a sizeable portion of the day is spent in the collection of water. Women and children are the primary water collectors for household water and children are the collectors of water at schools. Given the distances involved, the amount of water collected places virtually all users in the WHO “no access” category (Table 1). No Access When it is necessary to travel more than one kilometre or for more than 30 minutes to make a round trip to collect less than 5 litres of water per capita per day. Basic Access Where up to 20 litres per capita per day is available within one kilometre or 30 minutes round trip. Intermediate Access Where water is provided on-plot through at least one tap (yard level) and it is possible to collect approximately 50 litres of water per capita per day. Optimal Access Supply of water through multiple taps within the house allowing an average of 100–200 litres per capita per day. A major problem is that many area water sources are polluted. This is caused by surface water runoff from nearby agricultural land. As the primary sanitation facilities for most households are open pit latrines, employed by over 90% of the population, there is also constant risk of pollution from run off from latrines which often are not situated with regard to their proximity to water sources. 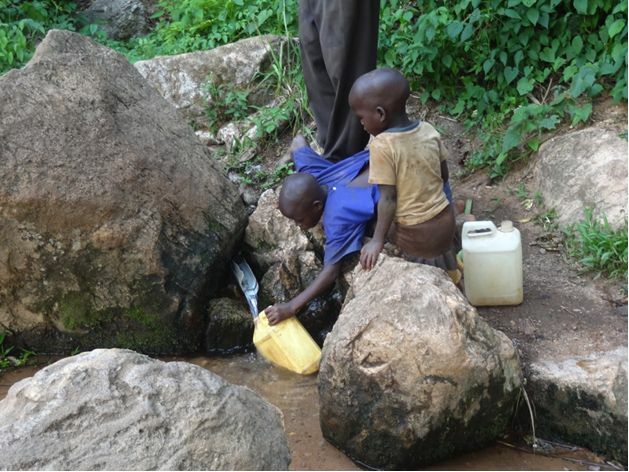 The risk to health from the local form of water collection is born out by area health statistics. As Table 2 shows, the top 3 causes of mortality in Mukono district, accounting for over 30% of total deaths, are known to be closely related to water quality. Children are the principal victims of these diseases. School Installations are sized to provide a minimum of 0.5 L/pupil/day. Each candidate school will initially be provided with a single tank. Once all schools have been provided for a 2nd tank will be built as funds are available. Rainwater is the key variable necessary for the solution to be feasible. 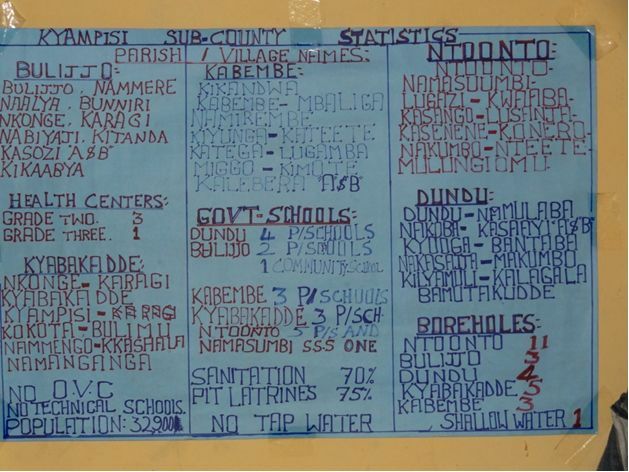 Data published by the Uganda Department of Meteorology for the Kampala area (table 3), was used to determine feasibility for schools and households and confirmed the feasibility of using Tanks. While several options exist for the type of Tank to be used to collect rainwater, based on cost, longevity and complexity of construction, the decision was taken to utilize an above ground Ferrocement storage tank. These tanks are built over a re-usable form that helps ensure consistent results, reduces costs and minimize the skills and training required for those constructing the Tanks. All materials necessary for their construction are readily available in local markets and the skills necessary to build them can be found within the local community. Plastic tanks for example, while available in the marketplace, are almost as expensive as Ferrocement tanks but in practice have only been found to have serviceable lives of between 5 and 10 years – far less than the 30-50 years expected for a Ferrocement tank. To simplify construction the decision was taken to standardize on a single tank design and size. This approach has many advantages, as it is much simpler and cheaper to construct a single size and design of storage tank and then use it on all installations and eases the training requirement of those constructing Tanks. To reduce complexity and implementation cost the decision was taken to implement a single design of Tank using plans made available by the UK based charity “Tools with a Mission” group. Tanks built to the design have been successfully constructed in many locations in sub-Saharan Africa. These tanks will be used for both school and household installations. For schools, analysis showed that two 2,500 litre tanks are required to ensure that tanks do not run dry through the year and that collecting water from a roof area totaling 0.3 M2 /occupant was the minimum. 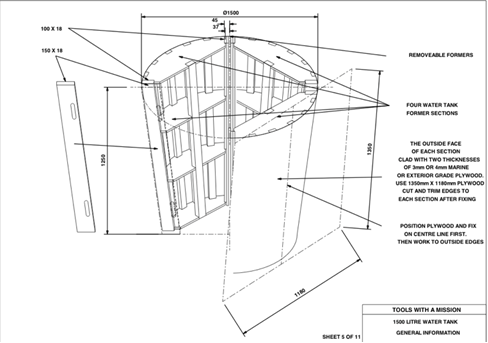 For schools in this project this requires collecting water from a minimum roof area of 105 M2. All schools meet or exceed this criterion. For Phase I Kirucodo scaled the TWAM plans from their original 1,500 L capacity to a 2500 Litre capacity. Tanks are constructed from Ferrocement using a removable and re-usable form as a mould. 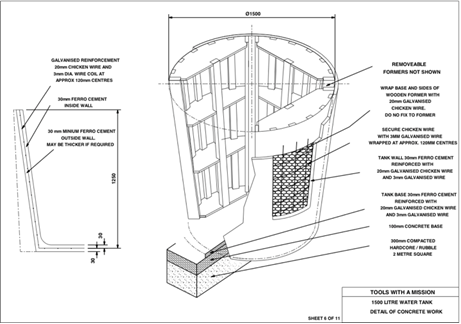 The form constructed for phase 1 has an estimated usable life of at least 50 additional tanks. A wire frame provides structural support over which mortar is “plastered” creating the shell of the tank. Rainwater is collected from roof run-off via a downpipe from the gutter to the tank. Water collected in the tank is accessed by users via a tap set into the tank at a lower edge. An integral top prevents unwanted material from entering the tank, polluting the water collected. It also stops vermin and other polluting material from entering and prevents mosquitoes and other insects from using the tank as a breeding ground. Access to the tank for periodic maintenance is via a hatch in the top. Tanks are constructed from 1 to 3 metres from the outside wall of the building from which water is collected. A full tank has a mass of over 3000 Kg requiring that the base and underlying foundation be properly constructed in order that it not shift post construction. The base on which the tank rests must be sufficiently raised that water can be drawn from the tank without risk that the water being collected could be contaminated from contact with the ground. A height of 50 cm between the outlet tap and the ground is enough that a 25 L Jerrycan can be filled without needing to be angled. 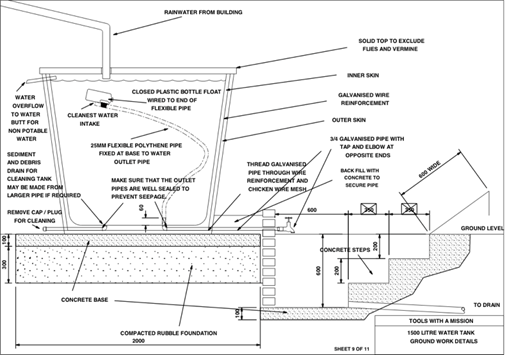 Tanks are built with an apron extending from the base so that the area where users stand while filling the tanks is hard surfaced by concrete, brick or gravel so as to maintain a sanitary and safe filling area. Galvanized metal is the preferred roofing material. Rusty metal, shingle or roofs of organic material can only be used as a last resort as they can harbour material and pathogens that can pollute the rainwater and are less efficient at delivering rainfall to the Tank. All school buildings in the Kirucodo area are galvanized metal (as are over 95% of residential roofs). Based on area rainfall data, a minimum 65 mm half round or similar size gutter is recommended in order that runoff can be delivered to the tank without spillage. Hard materials, such as metal or plastic are preferred. In Phase 1 locally sourced galvanized guttering was used which proved acceptable. It has a trapezoidal profile of @ 75 mm at the base and is easy to work and form with simple hand tools. All buildings will need to be equipped with gutters concurrent with the installation of the storage tank, as gutters are not commonly found on area buildings. Each 2,500 Litre tank is estimated to cost $550 to build. This cost is for materials only as volunteer labour is used to construct the Tank. Guttering is the largest cost variable as it is sized relative to the roof and number of occupants being served. Base 400,000 175 Maximum Estimated Cost. It is anticipated that for most installations a tank can be put into use 45 days from the start of construction. The critical path of the project is dictated by the time required by the concrete work to cure before a tank can be place into service. Once a tank has completed the concrete cure cycle, the fill and soak time before initial use requires at least 15 days. Soak time is especially critical as it allows the tank sufficient time to eliminate harmful bacteria prior to its being put into service. 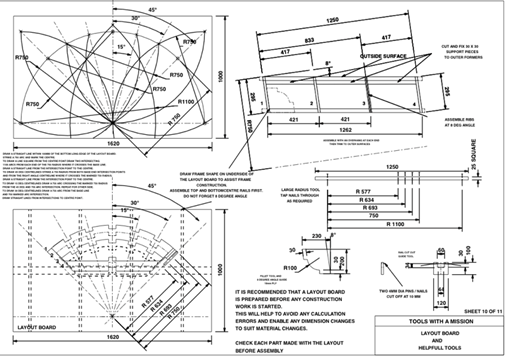 Selection of plates from plans provided by “Tools with a Mission.” NB that KIRUCODO has scaled all dimensions for the tank built in Phase 1 to provide a capacity of 2,500 litres.